Our London Audio Tour gives you around 145 minutes of audio for a 6 mile walk split into 2 sections, ideal for a leisurely 2-day walk seeing all the sites of the West End and City! 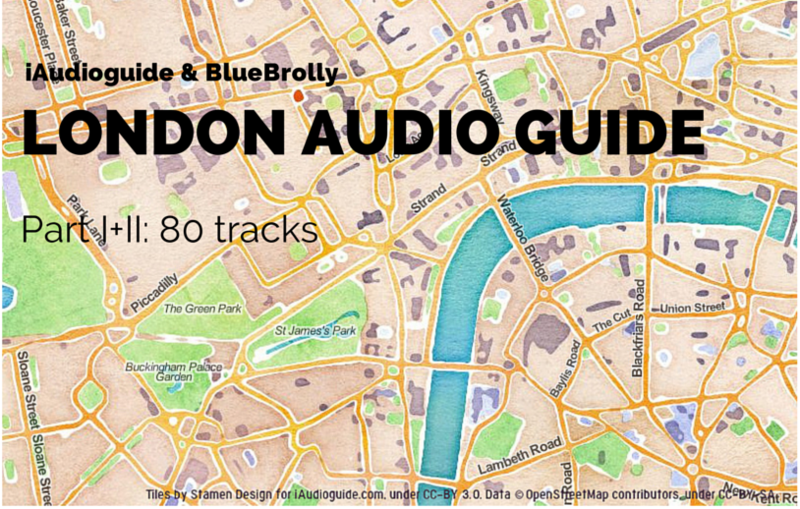 We also provide a number of thematic guides for parts of London, see the Bluebrolly audio guide overview here. Before learning more about the tour, the audio guide is available for streaming or to download on Part one: Amazon – iTunes – Google Play Music – Spotify and part two Amazon – iTunes – Google Play Music – Spotify. Click on the audio page of your choice, and listen to a preview there. As with out London Audio Walks we provide you with directions, colourful background and stories as you walk between the major attractions and sites. During our Full London Audio tour we guide you past THE ‘must see’ attractions which draw a visitor to the centre of the capital city. Our tour is split into two parts so that you can easily break your tour over 2 days if you wish. Also, the music stores do not allow for more that 50 tracks per album/guide, and our tour has over 80 tracks. Each part moves between sites and attractions with simple audio instructions, and because you are in control of the audio you can go when you want and take a break when you like. During the tour you can expect to hear about which of Henry XIII’s wives were executed at The Tower, why The Monument was built, a secret way to access the Bank of England, why non-Royals are not allowed to die in the Parliament building and much more. Attractions passed on the tour in part 1 are The Tower of London – Tower Bridge – HMS Belfast – London Bridge – The Monument – Lloyds Building – Leadenhall Market – the Royal Exchange – The Bank of England – Mansion House – Southwark Bridge – reconstructed Globe theatre – Tate Modern – Millenium foot bridge – St Paul’s Cathedral. Part 1 of the tour begins at Tower Hill Tube station and ends at St Paul’s Cathedral and is about 6 km long, which means about 3 hours walk and listening. Part 2 covers County Hall – London Eye – Trafalgar Square – The National Gallery – Whitehall – Horse Guards Parade – Downing Street – The Cenotaph – Big Ben – Houses of Parliament – Jewel Tower and original Palace of Westminster – Westminster Abbey – St James’s Park – Buckingham Palace – St James’s Palace – Jermyn Street – Regent Street – Piccadilly Circus – Chinatown – Leicester Square. Part 2 begins outside Westminster Underground Station and ends at Leicester Square and extends over 7 km, a 3 hour walk. If taking both sections in the same day you can use the underground to easily move between Leicester Square and St Paul’s. The various stops for the tracks of part one and two are.